In 2009, I began to change direction from being a conceptual artist to focusing on painting trees. 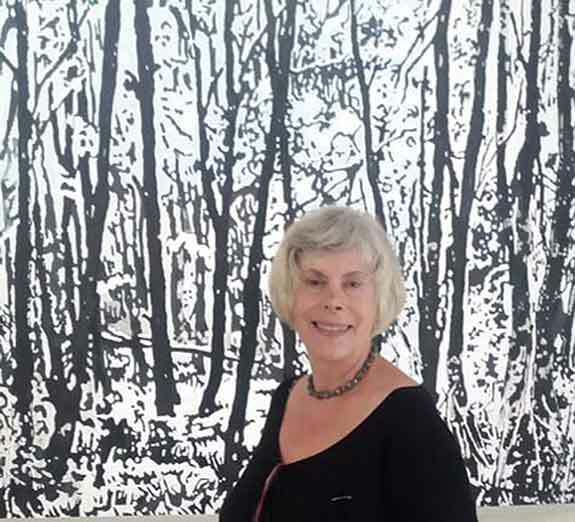 In 2013 I exhibited in the contemporary section of Under the Greenwood at St Barbe Museum and Art Gallery in the New Forest, and soon after became one of the founding members of The Arborealists movement. As a conceptual artist, my work often involved trees. In 1978, I exhibited Collected from Here, a series of sculptures and photographs about my mother’s orchard at the Angela Flowers Gallery in London. Soon after I exhibited thousands of real apples at The Richard Dermarco Gallery in Edinburgh. The ephemeral traces of my exhibitions are now at the Acme Gallery archive at The Whitechapel Gallery. However when reviewing thirty years of work, for my retrospective at the LCC galleries in 2007, I realised I had always being drawing trees, which because they didn’t seem to be part of my ‘political agenda’, I kept fairly quiet about, selling them cheaply to friends who appreciated them. After that exhibition I decided to live in the countryside in France where there were trees I loved and where I soon discovered that trees also have their political side. Visiting Gibraltar for eighteen months to paint palm trees, I discovered their importance in the development of every major religion, the historical and cultural context of our lives quite literally grows from trees.